For this you need hardly any time to prepare it. 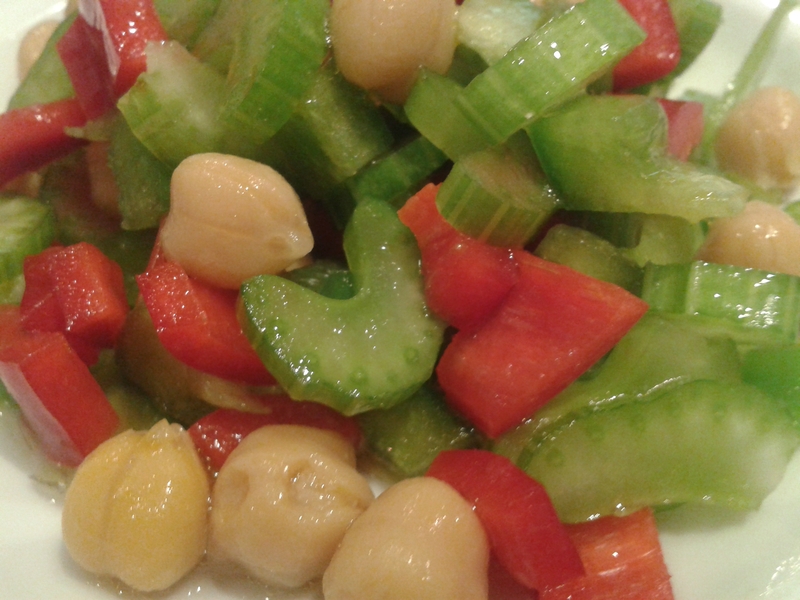 And, having tried it, you will understand that celery and chickpeas are a genuine combination. So, start like this: wash cellery and cut it into as thin as you want disks. Put the cellery into a bowl and per 2 units cellery add 1 unit canned chickpeas (or chickpeas that you have freshly cooked if you want it). Per 1 unit chickpeas add half a unit each of cut (again, as small as you want to) green and red bellpepper. Add some olive oil (about 1.5 soup spoons per cup chickpeas but you can vary it) and freshly squeezed lemon juice in equal amounts. Vary the dressing according to your tastes. Additionally you may (or may not) want to add salt and pepper.